Torbuk port has been closed to international shipping. 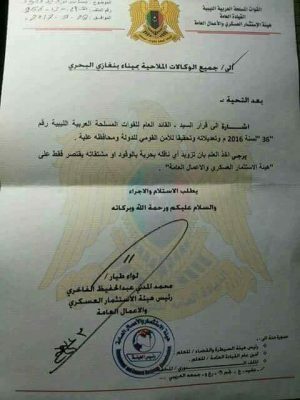 It follows an order by the head of the Libyan National Amy, Field Marshal Khalifa Hafter, to General Transport Authority director Mohamed Abdelgader, to stop imports and exports through Tobruk, and that foreign vessels should use the port of Benghazi instead. Oil shipments through Tobruk’s Hariga terminal are not affected by the order. No reason for the decision has been announced although there were suggestions that it is aimed at stopping smuggling through Tobruk. One other suggestion is that the move is to make money for the Libyan National Army. Last week, the port authorities in Benghazi were ordered not to refuel any vessels or supply them with oil products. That was now the monopoly of the Military Authority for Investment and Public Works. It is now reported that the authority has also taken over control of moving containers and storage security at the port. It is also reported that it intends to set up a similar operation at Tobruk port but that this has not yet happened. The LNA company is based on the model of the Egyptian army’s involvement in commercial affairs. 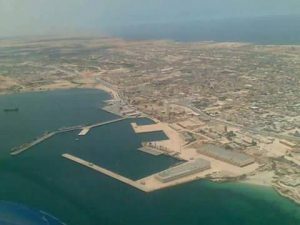 Benghazi port was reopened at the beginning of the month after a three-year closure caused by the fighting in the city and is now being used. On Monday, a tanker, the Anwar Libya, arrived in Benghazi with fuel from Tobruk to break the strike by private truck drivers who were demanding more money to deliver fuel to the city.